Corpus Christi Parish was established in 1916 in what is now the Warwood section of Wheeling to serve the growing number of Catholics that had settled north of the city. Prior to this time, the Catholics of Warwood attended Mass at Sacred Heart Church in North Wheeling. Street Car service every hour on Sunday provided the chief means of transportation. Rev. Patrick Gilsenan (Pastor from 1916 – 1921) was sent by Bishop Patrick Donahue to organize the parish and he was appointed as the first pastor on June 16, 1916. A home was rented which was located behind the present rectory. It was here that Church services were conducted for the new parish, while the combination Church/ School building was erected where the completed school now stands. The cornerstone for this structure was laid on September 24, 1916 in a ceremony presided over by Bishop Donahue. The original part of the present school consisted of four classrooms and a basement. Folding doors on the first floor when opened provided space for Church services. The school building served the parish also as a Church until 1924. The Sisters of St. Joseph of Wheeling staffed Corpus Christi School until it was transferred to lay leadership during the late part of the 20th century. To our own Diocesan Congregation of the Sisters of St. Joseph, the parish owes a debt of gratitude too important to be fully acknowledged at this time. From the very beginning of the parish and even before — the Catholic children of this section of Wheeling were educated by the Sisters of St. Joseph. Rev. Edward Galway (Pastor from 1921-1928) became our Parish’s 2nd Pastor. On August 19, 1923, then Bishop Swint laid the cornerstone of the present Church. The Church was dedicated formally with a Solemn High Mass on May 11, 1924. The architect of our present Lombard-style church was Edward Weber who also designed St. Joseph Cathedral. A newspaper report of this cornerstone laying stated that fully 5,000 people attended the ceremony presided over by Bishop Donahue who also delivered the address. The account also stated that a great Parade marched from 3rd to 26th Street, and then back to the school, and about 1,500 took part in this parade. The school building served the parish also as a Church until 1924. An interesting account and description of the new Church is found in the “Wheeling Register“- May 11, 1924. “The simple beauty of the Church exterior is achieved by strict adherence to the old Lombardic type of architecture. It is constructed of cream grey rough texture brick. There is a great arch over the opening of the porch and the tympanum is filled with brick and stucco ornaments. Over the porch, the gable wall of the structure is occupied by a coupled arched window seen from the interior above the organ. A fine bell cote rises 75 feet from the sidewalk. “This beautiful structure is formed on Basilica type, with clear-story and four stone pillars on each side of the nave carrying round arches. The nave ceiling is barrel-vaulted, the windows of the clear-story penetrating it. The side aisles have lean-to roofs plastered on the underside of the rafters. “On the front-the narthex runs across it entirely with stairs to the organ tribune on the epistle side. The main entrance on Warwood Avenue is in the center of the narthex, and at the gospel side is a door leading to the side street. The sanctuary has a square end: the priests’ sacristy is on the epistle side due to the proximity of this side to the rectory. The boys’ sacristy is on the opposite side with boiler room below and storage room above,the boiler room has a separate outside entrance. “The sanctuary floor is composed of grey Tennessee marble borders, steps and inserts: there is Westfield green risers with vari-colored tiles for the field. In the aisles and narthex the floor covering is of red quarry tile with cement borders and base. “Artistic features of the interior are found in the painted glass windows – the work of George W. Sotter of Philadelphia – in the hand-wrought chandeliers by Cox, Nostrand and Gunnison of Brooklyn: in the woodwork which is white oak stained in mission color and which predominates in the altars, Communion rail, Baptismal font, sedelia, pews and other woodwork throughout, being the handicraft of the American Seating Company. All these features were designed by the Architect. Over the sanctuary is a huge crucifix which is truly a magnificent piece of work. The pipe organ installed by the Estey Company, is an instrument of the highest order of excellence. The paintings on the side altars were done in oil by Mr. McQuaide. The Stations are in the usual French and Munich finish. The seating capacity, without the organ tribune is 550. The Architect was Edward Weber of Pittsburgh, the same architect who designed the magnificent Wheeling Cathedral. Rev. Arthur D. McSwiggan(Pastor from 1928 – 1934) became our Parish’s 3rd Pastor. Rev. William J. Lee (Pastor 1934-1955) became our Parish’s 4th Pastor. Rev. John S. Kelly was an Administrator from Jan. 30, 1934 – May, 1934. An addition to the school was completed. The Convent (present Parish Office) was purchased. Rev. Msgr. Edmund J. Yahn (Pastor 1955- 1972) became our Parish’s 5th Pastor. An addition to the Rectory was completed. Rev. Daniel Kirwin (Pastor 1972-1976) became our Parish’s 6th Pastor. Prior to Corpus Christi, Rev. 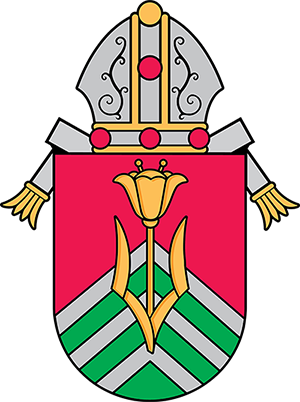 Daniel Kirwin and Archbishop Swint established the The Diocesan Scholarship Association (1961) which encourages students from our diocese to attend Wheeling College, now known as Wheeling Jesuit University. Since its inception, the DSA has assisted hundreds of students who chose to attend Wheeling Jesuit University where they received an excellent education at West Virginia’s only Catholic institution of higher education. Rev. John J. O’Connell (Pastor 1976-1979) became our Parish’s 7th Pastor. Rev. A. James Myles (Pastor 1979-1998) became our Parish’s 8th Pastor. Corpus Christi is proud to have had one of its own become the seventh Bishop of the Diocese — Bishop Bernard W. Schmitt. A community center was added to the parish in 1992. Capital Campaign – Thankful for the Past – Preparing for the Future – Throughout nearly a century, the people of Corpus Christi generously gave of themselves and their resources to build not only buildings but a vibrant faith community. Here, thousands have been baptized, received First Communion and Confirmation, were married and had their funeral rites celebrated. The school that began in 1916 continues to promote academic excellence and a solid Catholic formation. Parish Renovations – The Parish Community came together during the capital campaign to complete much needed repairs and updates to our Church. The interior and exterior of our Church was focused on including our stained glass windows, roof repair, plaster repair, carpeting, and restoring original artwork painted inside.